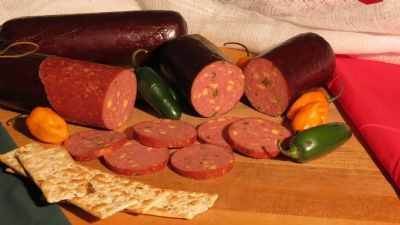 Jalapeno cheddar summer sausage available for online sale delivered right to your door. Seasoned with our signature blend of natural spices, jalapeno pepper and cheddar cheese summer sausage is made using coarsely chopped lean cuts of beef and pork, real jalapeno peppers and tasty Wisconsin cheddar cheese. Slow smoked over hardwood for aroma and robust flavor, the cheddar and jalapenos give it a bit of a spicy kick that is sure to please when hosting guests. Developed and introduced for customers asking from local festivals, this perfect blend of cheese and spicy jalapenos has made this type of summer sausage now sought out by folks from all around. Give some a try. You will be pleased. Crafted in small batches and hand tied still today jalapeno peppers with Wisconsin cheddar cheese summer sausages makes a great gift, a power packed energy snack, good for an appetizer or a whole meal. Add some variation to your order. 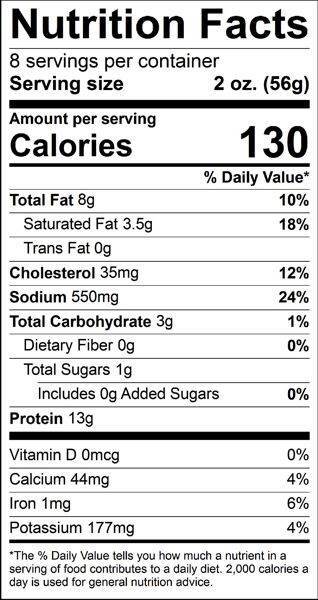 Ingredients: Beef, pork, (cheddar cheese [cultured milk, salt, enzymes], water, cream, sodium phosphates, salt and beta carotene), powdered cellulose, potassium sorbate and natamycin], water, salt, dextrose, corn syrup solids, soy flour, spices, jalapeno peppers, garlic powder, natural smoke flavor, lactic acid starter culture, monosodium glutamate, hydrolyzed soy protein, sodium erythorbate, sodium nitrite, collagen casing. This is great sausage to add to the eggs in the morning to add that extra spice and flavor. The wife and I enjoy it a lot. This summer sausage is to die for. Wanted to let you know we are enjoying the Summer Sausage That I have ordered for y'all and Thank you for the quick shipping. 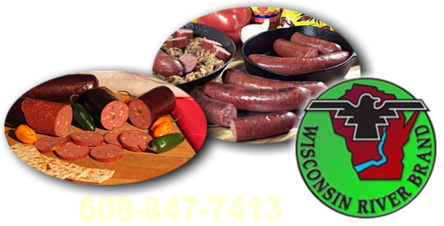 Merry Christmas to all of you at Wisconsin River Meats and Happy New Year. God Bless!! Recieved my order and not disappointed thank you! Service Area: Mauston, Baraboo, Sparta, Tomah, Portage, Waunakee, Nekoosa, Lodi, Poynette, Cross Plains, New Lisbon and surrounding communities.